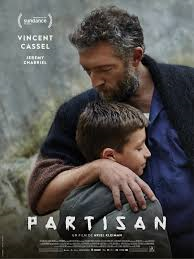 Partisan is a thought provoking and visually enthralling piece of cinema which makes one question who and what are the true influencers of children and while being protective is paternal instinct, when is being protective being too protective? Young Alexander (Jeremy Chabriel) is the eldest in his community which consists only of mothers, their children, and one father figure to them all, Grigori (Vincent Cassel). Now Alexander has reached an age where he is starting to question everything he has been taught by Grigori and wonders whether the outside world is really as terrible as he has been led to believe. By even contemplating these things, he is going against everything he has ever been taught be Grigori and that in itself could be dangerous. Partisan is certainly an intriguing watch. It's suspense is not what has become the norm in todays cinema culture, but relies on it's psychological edge. This may not sit well with some members of the audience who may want something that is a bit more fast moving and less drawn out to keep their interest, but there is a lot being said under the surface of this film. What is a striking theme in Partisan is one that many parents will be able to relate to and that is over protection of your children. The community which Alexander belongs to can seem beautifully idyllic and the innocence the children hold onto is glorious. However, when does being protective of your children turn into being unhealthy? Alexander has problems socializing with those outside his community which is an inevitable side effect of not being exposed to the world, but as is also expected he finds that there is beauty in the outside world which he is missing out on. So while the children certainly seem happy in their surroundings, they progressively miss out on more the older they get which is something that Grigori did not realise when creating his paradise. Yet, while Grigori is being over-protective of his acquired children, he is also using them as revenge tools against those in the outside world who have done him wrong. Grigori is an extreme case, but it does make one wonder whether in certain situations is there more danger at home than outside. In the younger and more susceptible years, the parent is the greatest influencer in a child's life until they reach the teenage years where they show that they are capable of thinking for themselves. This is not to say that outside influences play no part in a child's development, but it is more harmful for a child to be around harmful behaviour from a parent in these younger years. Visually Partisan is absolutely stunning and thoroughly intriguing. The production design of the garden in which Grigori's community live is so interesting and atmospheric. It has an overall atmosphere which changes over the course of the film and feels calm towards the beginning and sinister as it concludes. The children's world in their classrooms and parties are also so much fun with their face-painting and karaoke. 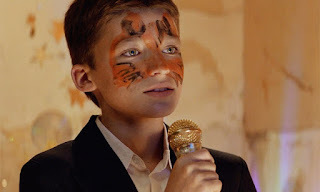 Jeremy Chabriel makes a stunning film debut as Alexander. He is the perfect representation of a boy who is making the progression into a young man and as teenage boys do, is starting to question everything he see's and hears in his journey to becoming his own person. It is inevitably something all the children around he will go through, but something Grigori has a problem with as he believed his methods would keep his world the same. Vincent Cassel's Grigori is really a fascinating character He is a man that demands fear as one is never quite sure what he is capable of. There are many questions that till remain about Grigori at the end of the film which can be unsettling as he is a character one truly wants to learn more about. Partisan is a subtle and unique film which makes one question the boundaries we place on children and the traits they inherit from their parents. It sends a message to be careful what we teach our children and how we prepare them for the world.